Preheat oven to 400°F. Line baking sheet with parchment paper. In saucepan, bring 1 cup water, olive oil, sugar and salt to boil over medium heat. Remove from heat. Add flour all at once; with wooden spoon, stir vigorously until mixture forms a ball and leaves side of pan. Return to medium heat; continue stirring vigorously for 1 or 2 minutes or until a thin dry film forms on bottom of pan. Remove from heat. Transfer to bowl. Bake for 35 to 40 minutes or until light golden brown and puffed. Cut a slit into each puff and return to oven. Reduce heat to 350°F; bake for 10 minutes. Turn off heat and let puffs dry in oven for 10 minutes. Transfer to rack; let cool completely. Using electric mixer, whip cream until soft peaks start to form. Beat in icing sugar and scraped vanilla bean seeds until stiff peaks start to form. Fold in bourbon. Split cream puffs. Remove any strands of soft dough with fingertips. 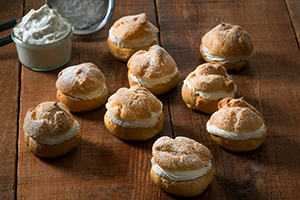 Fill puffs with whipped cream mixture. Dust tops with icing sugar.